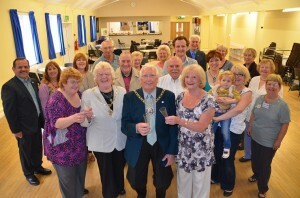 The Parish Council were delighted to welcome the Mayor and Mayoress of Peterborough. Sarah Gosling from WREN and other distinguished guests to the open afternoon to celebrate the refurbishment of the Leeds Hall. The Hall now has new lighting, a new boiler, a new cooker, a refurbished kitchen and bar area, redecorated hall, new curtains. We also have a screen and projector that can be hired for presentations etc for a nominal charge – please contact the clerk. Many thanks go to WREN for the main grant funding and toward councillors Ray Dobbs, David Harrington and David Sanders for donating part of their Community Leadership fund for the last two years towards the project. Thanks to Andy Bedford, the electrician who lives in Eye for fitting the new hall lighting free of charge. Thanks also go to the users of the hall for their patience whilst the work was ongoing and a very special thanks to Sandra Short, the Leeds Hall caretaker for her extra patience and extra hard work during this time. This entry was posted in News on 30th August 2012 by eyeparishadmin.